Heat oven to 350°F. Grease 9-inch pie plate. Melt butter in 10-inch skillet over medium heat. Cook onions and garlic in butter 2 to 3 minutes or until onions are tender. Stir in spinach; spread mixture in pie plate. Spread with cottage cheese. Stir Bisquick mix, milk, lemon juice, pepper and eggs until blended. Pour into pie plate; sprinkle with Parmesan cheese and nutmeg. Bake about 35 minutes or until knife inserted in center comes out clean. Cool 5 minutes. Sprinkle with additional sliced green onions, if desired. 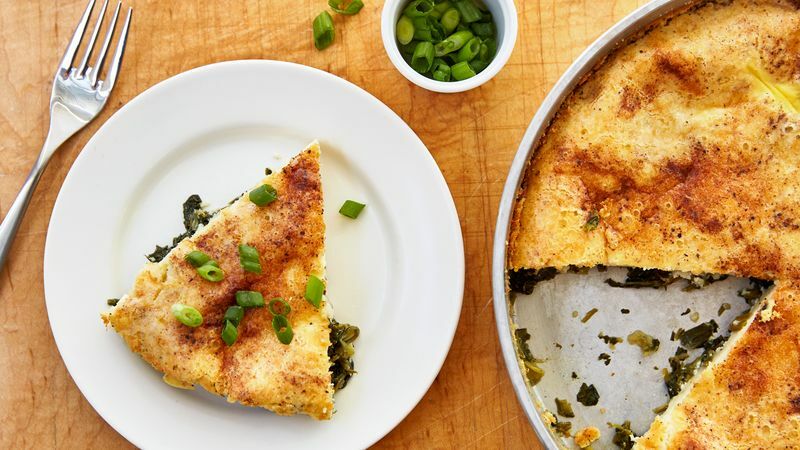 Serve a crisp green salad topped with your favorite dressing with this easy meatless pie. Drain the thawed spinach thoroughly; a wire mesh strainer works particularly well. Added liquid from the spinach can affect the flavor and increase the bake time. Use the microwave to defrost the spinach in a snap.